It is no wonder that in this world that cannot keep pace with itself, people seek inner silence and peace. 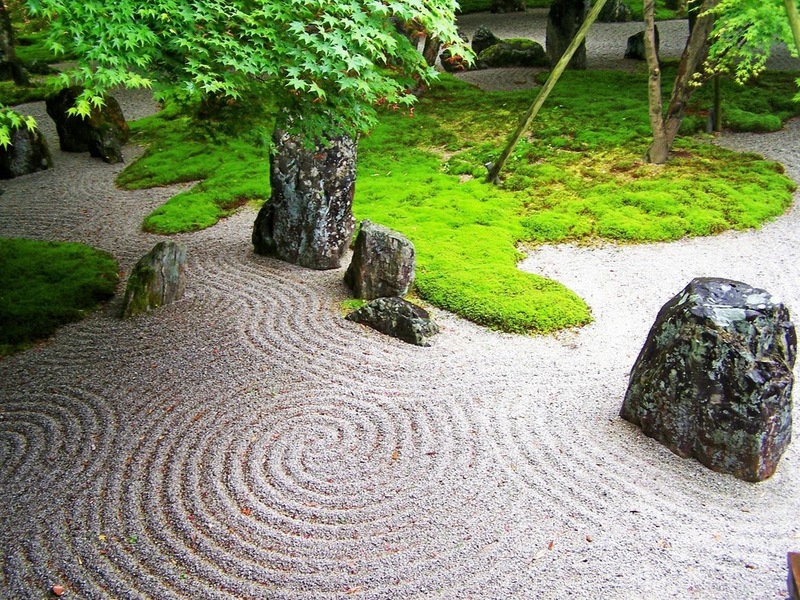 Many paths appear to lead that way, and one of the more popular paths is that of Zen buddhism. Its philosophy is deep and although not thoroughly understood by most people, has something that attracts people seeking the end of their suffering. Or at least a small rest from their hectic lives with schedules, appointments and deadlines. Zen has no appointments, no schedule and no deadlines, which for some people is different enough from what they have in their lives to be worth looking up. Yet the western culture has taken the face of buddhism, but failed to grasp the spirit, so in most cases it has ended up with a dead body, which has to do with buddhism as much as a corpse has to do with the live person. Like the image above. The picture doesn't need a caption for anyone who has ever heard about Zen. Pictures like these have come to be associated with what Zen is and what it means. What do we see? We see a face with eyes closed - the Buddha meditating - and we see a very serene background. In other words follow this path and you too will be serene and clear. All your troubles will go away and all your problems will be magically solved. Also the moon in the picture is overly large and photoshopped to have a surreal beauty - a sign of the beauties that you will discover in your inner world. Peace, happiness, serenity, and also very special and sublime states. This is where the problem starts. Zen is what this picture represents it to be inasmuch as that moon in the picture is real. 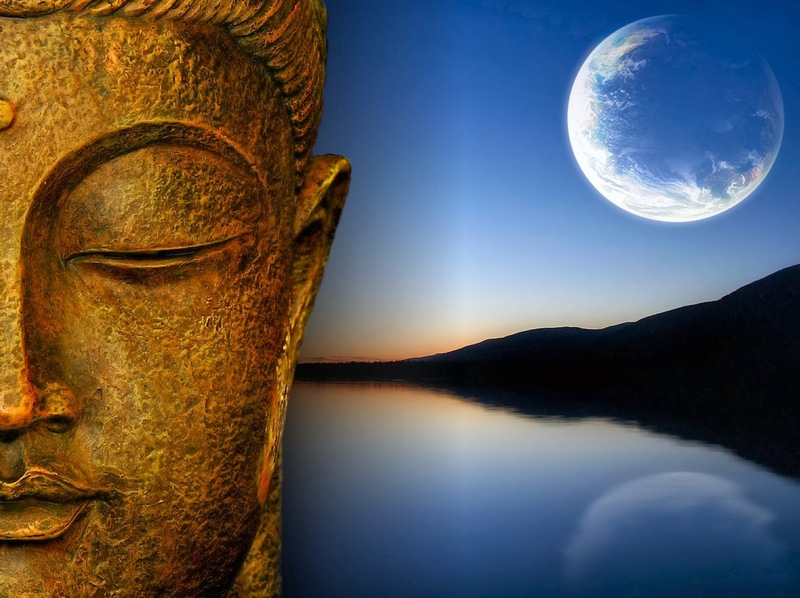 Our western culture has photoshopped Zen buddhism together with that moon. Why do we keep doing that? We take something that we want to promote and amplify and augment it to make it look one thousand times what it really is. A woman once went up to Madonna and very admiringly told her that she envies her looks and would very much like to look the way Madonna looks on the cover of magazine X. Madonna replied: Yes... so would I! We do that because the unaugmented image would appear dull and boring. Reality in itself appears to us dull and boring (at best). People would look at an unaugmented picture and go: "Yes? And? What is so special about this? Why do you show it to me?" So we have started to paint our realities, because we cannot handle the objective reality as it is. We find it uninteresting and depressive. And an even bigger problem is that we don't even see this as a problem! We want a fairy tale, a break from our ordinary lives filled with unhappiness, despair, problems and agitation. We have a "bling" approach to life. We are attracted to all that glitters. Not different in essence from the behaviour of a crow which picks up anything shiny and glittery. Not manifesting any more emotional intelligence than a crow either. Well, if you find yourself thinking like that and are attracted to Zen buddhism thinking this is another way to quickly amp up your life because you will have special experiences and will become the neighborhood guru, or think you will solve your problems quickly and magically, think again. 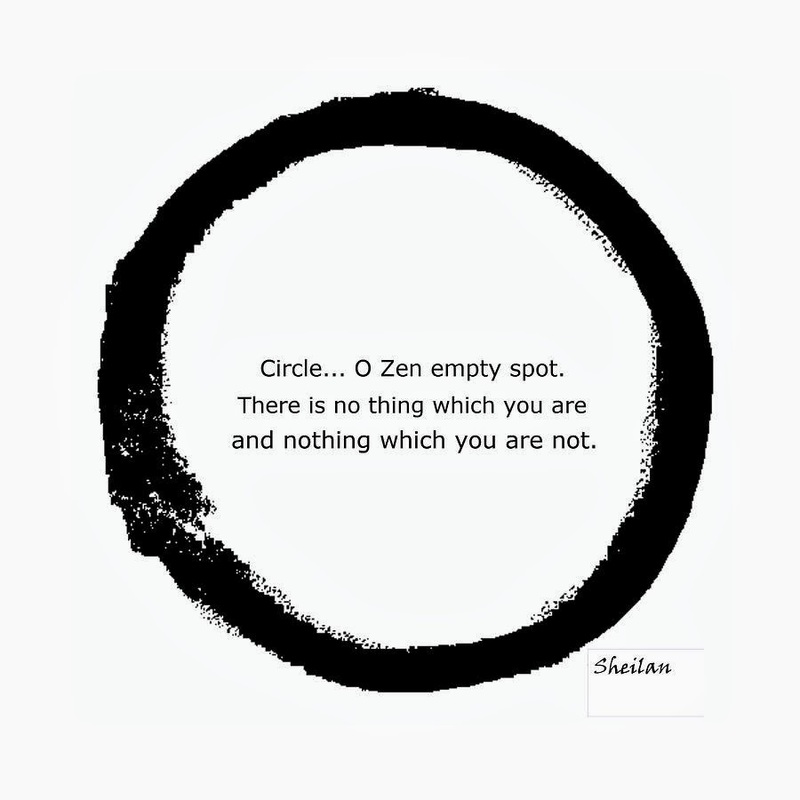 Zen, the "real stuff" as it is, has nothing like that. At least not for a good portion of time, which is by far longer than what most modern people would be willing to wait. The word Zen is japanese and has come from the chinese "chan" which in turn has come from the indian "dhyana". At its root it means something very simple: to sit quietly. It does not mean to levitate, nor any other state or special action or activity. And no, there are no special techniques, you won't have any special experiences, and your head will not explode into the bright light of enlightenment. Does all this mean that Zen is a fake? No, it does not. It is a very powerful path of transformation and evolution, that ultimately will help you evolve and perhaps one day, in this lifetime or another, will lead you to enlightenment. But before getting there, actually before even starting the journey, we have to understand where such a journey will take us. The reason I am writing this, is that all too often I have inspired people to take up meditation. And the vast majority have given it up very quickly, most of them within five sessions of meditation, because they had very different expectations of what would happen during and after such meditations than what actually was normal practice. So let's take a minute and review what such expectations might be: bliss, silence, concentration, the absence of thoughts, inner peace and perfection, and immediate superior understanding (compared with the lesser mortals who don't meditate). What happens in reality? What is Zen about and how do we see it? The complete opposite. If you take up meditation this is what you will encounter: restlessness, a hurricane of thoughts - and i don't mean lofty thoughts about spiritual evolution, but thoughts about paying your bills and setting up meetings and getting things sorted -, a constantly chattering mind, no concentration whatsoever, and also a lot of feelings, most of them unpleasant, the kind of feelings associated with whatever it is you are running away from in your life, and with chapters of your life you haven't quite come to terms with. And if you think that all of this will in the end leave you with some superior understanding, well, you're wrong again; many meditation sessions will force you to witness how confused you actually are. So if you've seen movies about saints going into the desert to meditate and they do this to let the spirits of the desert assail them and by this to attain a higher state of evolution, make sure you understand what is going on. Those demons are not the ones you see in movies like "the exorcism of emily rose". They are your every day demons that have been haunting you and you may know them very well. But you haven't been paying them enough attention until now. Be sure that if you grant them an appointment by sitting still and letting them come to you, they will! So when they do come to you, what do you do? What do all newcomers to meditation do? They push them away. They say to them: "Look, I am not sitting here to be with you, my demons. I am sitting here because I have heard that if i do this i will be serene, peaceful, and so on. So go away and let me concentrate and reach those nice states of being for which I have taken up this meditation stuff." Needless to say that the attempt to push these mental and emotional events away when you meditate is not going to get you anywhere, it actually is the exact oposite of what Zen is about. Even if you hipnotize yourself into believeing you are tranquil and serene, in reality you are running away from your inner world and that is the exact opposite of what Zen teaches. On top of all this, you may very likely walk away very confused, as your experience with meditation has offered nothing even close to the ever so popular Zen images. Many people misunderstand their experiences thinking that this "meditation stuff" is not for them, because they have tried it and they didn't get to the bliss and peace they expected. They didn't even manage to still their minds. So what are they doing wrong? 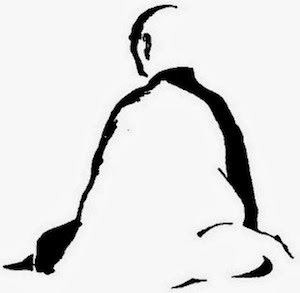 The truth of Zen is very different, in fact actually quite the opposite of what western capitalist culture teaches us. So it shouldn't come as a surprise that most of us don't understand it at first. But not because it cannot be understood, but because it requires first of all a true desire to see things as they are. A desire to understand, not a desire to brag about meditation. This is why Zen has been marketed in a way very different from what it is. Because very few people would be interested in the plain, unaugmented reality. And reality is what Zen is all about. Whilst meditation is "free" and the blissful states you may be looking for will not have a price tag attached paid in some currency, let's make sure we get things straight: NOTHING in life is for free. If you are looking for a quick fix, a shortcut to instant happiness, this isn't it. And there is no such thing as a quick fix that will deliver fantastic, amazing and also true and lasting results in any realm of life. True Zen, starting from philosophical grounds up, called right understading, and continuing with practices such as meditation, and continuing with how you feel during the process, all this requires effort. Very significant effort by the standards of western society. Actually the more valuable an experience (and we are talking about one's spiritual evolution and understanding) the more effort is required to get there. So right off the bat, this is one aspect about Zen that is hard to sell. It requires effort, a regular practice and takes time. Bored already? Which is why you don't see it in images suggestive of Zen. What are people excited about? Hard work and commitment that delivers predictable results or instant quick fixes? But the matter of fact is that quick fixes deliver results that are as real as the photoshopped image. But spiritual practice is much harder than that for some more reasons. Another top reason on the list is that it makes you confront your demons. All that pent-up stuff you don't like or haven't come to terms with and are carrying it with you every living second of your life. Happiness and serenity and inner peace are not the result of running away from or pushing away of unpleasant stuff. This is rather the reaction of a spoiled child which runs away from difficulties instead of working them out and learning valuable lessons in the process. Is it hard? Is it painful? You bet it is! Is it worth it? THAT is the first true realisation upon choosing to walk on this path. It is. It's nothing spectacular, there is nothing special about it. You won't be able to brag about it. But it will be very real and very worthwhile. The simple common sense of buddhism states that we are here to evolve. To learn about ourselves and the world we live in. To learn about our emotions, our aspirations, and everything else we experience. And we are here in this universal playground to test our understanding by exercising one of our greatest gifts as human beings: the freedom to choose. The choices in life we make reflect our understanding of how things work. Karma simply means we will get feed-back for those choices. And by understanding that what we get is a result of what we did in the past, and that in turn a result of how we understood things then, we can try to improve our understanding and hence make better choices which will lead us closer to happiness. What Zen buddhism does, is that it take a very direct approach to that. The goal of Vipassana meditation, also called Insight meditation, a core meditation of buddhism, is to see things clearly, as they are, by a simple effort of sitting still and becoming increasingly more aware of everything. We are not involved in making things happen, which would in itself be a manifestation of our understanding, but we sit still and are receptive, like an empty cup waiting to be filled with the insights we gain from seeing clearly moment to moment. It is here that we enter a world full of paradoxes, so classically associated with Zen, but which in reality have nothing to do with Zen in particular, but with how the world is in reality. Every true spiritual path will arrive at the same paradoxical truths. We sit silently, yet inside there is anything but silence. Although the experience of meditating in itself may be anything but peaceful, for it puts you in contact with your worst fears and least pleasant emotions, the commitment to sit them through and see beyond appearances will be rewarded with wisdom and peace. But it requires patience and effort. The effort which I keep going on about is actually the resolve of keeping going, because true insight is that we have a number of emotional reactions which are automatic, we work all the time on autopilot. Our reactions to various stimuli are like a reflex. We are so cut off from the true reality of direct moment to moment experience, that we are the captives of our automatic choices. Insight means seeing that certain reactions are not necessary, or are based upon a wrong or incomplete understading of things. Once we see that, we can CHOOSE to stop reacting out of habit as if sleepwalking, and act in accordance with seeing through the veil of illusions. This leads us many times to stop acting in certain ways. Hence the paradox: make the effort to stick long enough in this practice to achieve the insight necessary to simplify your internal life and stop all efforts. Happiness, very much against the ideas of our society based on "more more more" is in reality achieved through "less". Less is the real more. As a saying goes: "happy is not he who has the most, but he who needs the least." By gradually cultivating and expanding our awareness, we gradually see beyond the "label world" in which we have lived until now. What do I mean by that? Well, you meditate in silence and then you hear a dog barking or some other sound. Immediately your mind labels the experience "dog barking" or whatever it is you are hearing. As of that moment you are cut off from hearing the actual sound of the dog barking, and your mind goes on and on in waves of thought: "aah, that dog...! it always barks! I can't even sit still in silence because he always has to bark. I must talk to the neighbour about his dog..." All this time the dog keeps barking but what is in the mind is not the bark as in the sound of the bark, but various reactions and emotions in reaction to the bark. So although it all started with something rooted in objective reality, our reality is made up mostly of our reactions to that reality, our labels of that reality. There is a huge difference between quickly sipping a coffee on the run at work whilst working or thinking about a hundred different things, and sitting quietly with a cup of coffee, no hurry, and immersing yourself slowly in all the experiences associated with that cup of coffee - the smell, the warmth of the mug in your hands, the way the cup touches your lips, the subtle flavours as they spread in your mouth, and so on. It is not the reality that is different, but our attention to that reality and hence our perception of it as well. Also, our sense of being nourished by an experience, whatever the experience. If we reduce an experience to a set of labels, we will not be able to be nourished by these labels, for only objective reality can be fulfilling. Also, words like "special, beautiful, fulfilling" change their meaning completely. By paying close attention to whatever experience we have, and hence by seeing beyond the usual labels we put on things, we start to enjoy extremely simple activities. The beauty of a simple and common sound like that of a dripping faucet or just the traffic outside; an every day image like a book sitting on a shelf; a sensation which can be as simple as the lips touching each other. We may believe that these have nothing special and cannot possibly have anything to do with happiness or bliss. But "special" or "common" are labels in themselves. "Ugly" and "beautiful" also. As the saying goes: "beauty is in the eye of the beholder" - it has nothing to do with the objective reality of that person or object, as is made clear by the fact that the same object can be labeled differently by different people. By going beyond these labels we see that actually these exist only in our minds. The objective reality simply "is". And gradually, with practice, we discover the simple and strange beauty of happiness associated with just... being! Not doing anything, not needing anything. We are not essentially incomplete and unhappy and need to be whole again in order to be happy. We are whole. But we don't usually look close enough to see that. Once we start seeing that, we understand that we need less of everything, not more. In a first phase the biggest hurdle will be to have the patience to sit through unpleasant states of mind. If you survive in meditation long enough you get to the phase in which there are more and more pleasant states. Some of these can be so beautiful that they have nothing to do with ordinary life and one can easily get attached to them. Attachement however is tension, and that in itself prevents happiness. Pleasant states are also just part of the show, just like unpleasant ones. The idea is not to pursue pleasant states of mind. As you continue practicing, meditation will be your guide to the most unpleasant and also to the most pleasant of states, and ultimately your inner spiritual master that will teach you equanimity in regard to both. That however is easier said than done! The full transcendence of these states equates with enlightenment. But even after a few weeks of regular meditation one will begin to see clear benefits, that will grow with practice. In other words, get comfortable and used to the idea that for a very long time to come you will continue dividing things into pleasant and unpleasant, and perhaps some that will be neutral. So what do we usually do whith these things? Very simple: we pull the pleasant states/things to us, and push the unpleasant ones away. Again, this is a reflex that is extremely strong, and it is based on the incorrect view of happiness that states that happiness can be achieved by stringing together as many pleasant experiences in as little time as possible, at the same time completely avoiding unpleasant ones. This is obviously impossible and also if it were, it wouldn't be fulfilling in a deeper way. What older students of this path gradually learn through time and experience, is to be more tolerant, less caught up in the quality of an experience and simply to see it as it is. That includes tolerance with one's own tendency to divide them up into pleasant and unpleasant. It is a totally humbling experience in which you accept that you are attached to an experience, and also accept that you are pushing another away. But you gradually develop more patience and tolerance to both, as well as to yourself as a person. You gradually become more open to whatever lies inside of you, an openness grounded in tolerance and acceptance. Zen therefore doesn't mean not having them, nor pushing them away, but accepting them in your experience like a humble and welcoming host opening the door to guests without judging them. The ultimate paradox is that when you become completely accepting and tolerant, in the end there is just silence and ultimate bliss. That is, when you stop pushing them away and are not concerned with them anymore, they also stop coming. So only when you give up on enlightenment and are completeley acepting of this world and these experiences, do they "go away". This is the final image so often associated wtih buddhism and Zen and portrayed everywhere. But the paradox is that you have to completely give it up in order to achieve it. 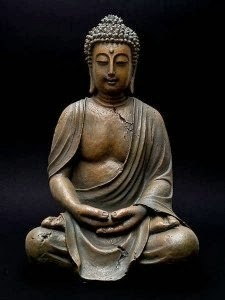 There is an interesting aspect of how buddhas are depicted in pictures or sculptures which is very typical of buddhism and how to go about things. The image just above is of a laughing buddha, called by some a japanese buddha. Further up, the buddha on a black background is an Indian buddha. They are very different in appearance. The indian one is very slim, sits in a perfect lotus posture, its spine erect, eyes closed, face serene but focused. One would associate it with the ascet achieving perfection. But the paradoxes we just talked about tell us that if we are very serious about achieving enlightenment, this only translates as attachment. Attachment means rejecting present reality and wishing for something that is not present, therefore unreal in this moment. That is not the way to achieve enlightenment. Actually enlightenment is the ultimate insight that we were never imperfect to begin with. We were simply "asleep", unaware. "the buddha" literally means the awoken one. So there is nothing to strive for. Therefore the laughing buddha is completely different from the indian buddha, in the desire to convey the message that one should not become too tensed up or attached to the idea of becoming enlightened, nor to the idea of perfection in any sense. Therefore he is very relaxed about life. He is not an ascet, he eats a lot and therefore is fat. He is not in a perfect posture, because he is aware that perfection does not lie in a posture. Perfection is everywhere, because there simply isn't anything imperfect in this universe. Enlightenment only means a change in the degree of awareness of everything, not in posture. And as he is very relaxed, he can enjoy the whole universe and doesn't take anything too seriously, and therefore is able to have a laugh. 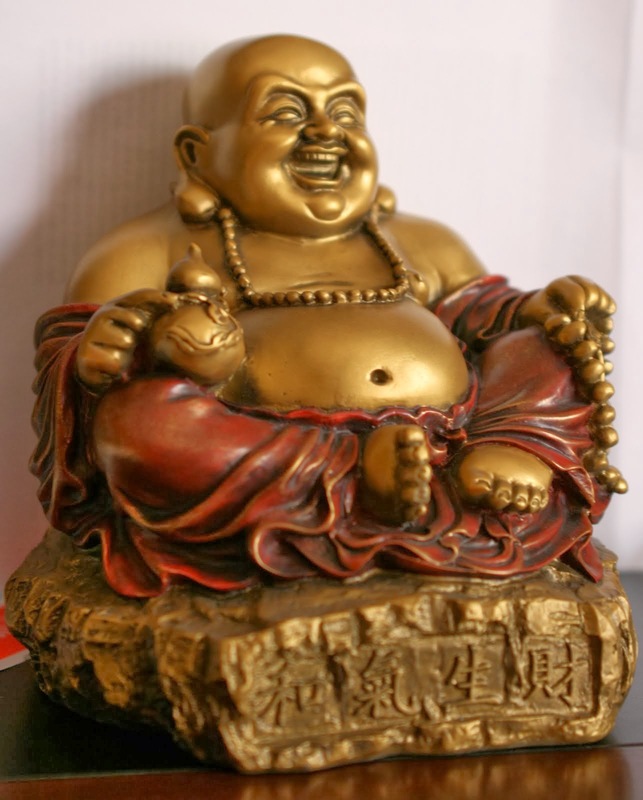 So, my message to you - be like the laughing buddha. Don't tense up about things and don't take yourself too seriously. But be mature, and realise that if you are serious about making a change in your life that is aimed at taking you to a deeper understanding and a greater happiness, this will require commitment, effort and perseverence. Effort and perseverance to keep going past the aversion aimed at your worst nightmares and past the attachements to states out of this world. Zen is neither silence nor noise. Neither pleasant states, nor unpleasant ones. Zen is a tolerance and awareness that allows you to be in both, whilst untouched by any of them, yet in perfect awareness of them. And if in doubt, have a laugh!